The other afternoon, as I was organizing one of my kitchen cupboards, I came across my popsicle molds, which are normally used a lot in the summer so I can make healthy juice pops for the children. I tossed them into the sink to wash, and as I did, my eyes fell on the bottle of freshly-pumped breast milk I had set aside to store, and that's when inspiration struck. Breast milk freezes well in a bag. Why wouldn't it freeze well in a popsicle mold? Because breast milk is a precious commodity, and I have plans for mine, and each mold cavity holds two ounces of liquid, I only filled two of them with liquid gold, and set them in the freezer to see what would happen. Dad: "Is that good stuff?" Dad: "Is it? What does it taste like?" To which each child would reply with their own opinion. The oldest always said "red popsicles", the middle one (who is the ornery one of the bunch, and has always found himself extremely amusing, even as a toddler) would invariably say, "dill pickles", and the baby, our only little lady, would chirp the word "marshmallows!" with exuberance and joy, followed by the proclamation that it was "deee-wicious!" I allowed my milk pops to freeze overnight, and unmolded one the following evening. I had to let the mold set in a bowl of cool water for a couple of minutes to release the final product, but it finally came out fairly well--and what I held in my hand was a sleek vanilla-colored creamsicle. I was so excited that I went on the search to find the Mister. "Check this out!" I cried when I'd found him. "I made a Momsicle!" He looked up from the newspaper with absolutely no surprise. Very little fazes him, particularly now that I am blogging about our life. "Did you say a momsicle?" he asked. "Yes! I made it from my milk. Here," I said, holding it out to him. "Try it." He took a bite. So did I. If you're into consuming breast milk for health purposes, have some extra milk stockpiled, and happen to like ice cream bars, Momsicles might just be the way to go. Some women give them to their little ones to ease teething pain, too. 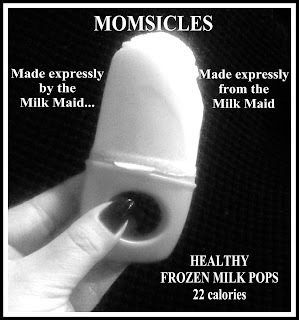 Because the calories in breast milk vary from woman to woman, depending on diet, and the time of day milk is expressed, (as well as the size of your popsicle molds) it is difficult to determine just how many calories a typical Momsicle will contain, but each of mine was approximately 22 calories, and you can be sure, no matter what, that your Momsicles will be loaded with lots of nutritious vitamins, nutrients, immune-boosting antibodies, and good fat!